Once again, its time for a Daring Baker's challenge and after several rounds of savoury offerings, I was happy to see that this month's challenge was a sweet one! This time, the pick was a Caramel Cake with Caramelized Butter Frosting by Shuna Fish Lyon. 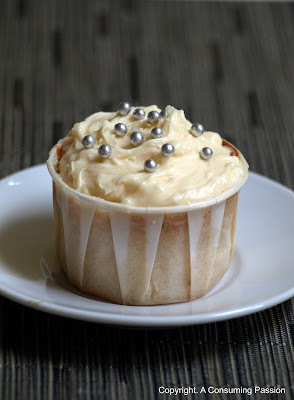 As I often do, I turned this cake recipe into cupcakes as I always find that makes it easier to share with friends, and in keeping with holiday spirit of this season, I decorated them with some "bling". All of the components of this cake were easy to make and I managed to do them all within about 2 hours. If you are pressed for time, however, the frosting can be made ahead and kept in the fridge and I imagine the caramel sauce can be as well. The results? Scrumptious, but extremely sweet. Definitely for caramel lovers only. For original recipe source, Bay Area Bites, click here. So simple and pretty with the silver dragees! Definitely for the sugar lover, but still a wonderful recipe. There is something about those little beads of silver that simply make my heart go "Wheeeeee", they make everything so girly, delicate and dainty. A very, very nice addition to your already oh! so cute minis! Bravo! I did cupcakes too! Yours are so cute! Love the bling! Great job on these cupcakes! Love the cupcake and the silver "bling!" Well, your cupcake looks wonderful. I do love your "bling." I wish I had thought of something like that, I am a horrible cake decorator. Great job. I love the "bling" on your cupcake, it's so pretty! Oooh! I'm always up for a cupcake and this is one I haven't tried before. Sounds delicious and looks so pretty. Beautiful bling... a little silver amongst the golden caramel buttercream. Thanks for baking with us this month! I LOVE your little cupcake...the silver doo-dads are so cute!